“1963 – That Was Year That Was” is a current series being aired on BBC Radio Two celebrating the 50th anniversary of the highs and lows of a year that shaped the modern world for years to come. Three particular events from that year have caught the public imagination here in the UK. It was the year President Kennedy was assassinated. It was the year Dr Who first hit our screens. And it was the year that the Profumo Affair rocked the innermost sanctums of politics and the elite of British society. The story of the 1960’s scandal which was played out in front of the world’s media has been turned this year into a West End musical, named after the most tragic character within the scandal, the eponymous Stephen Ward. The society osteopath is not the only character from this incredible story to be under the spotlight. Central to the plot was the beautiful property that provided the backdrop to the ‘affair’, Lord Astor’s country estate, Cliveden House. Now owned by the National Trust and run as one of the most luxurious hotels in the country, Cliveden has seen a number of different wardens over the years and is now sister hotel to fellow iconic property Chewton Glen. In line with its new chapter in history, Cliveden has undergone a spectacular refurbishment of its main restaurant and installed celebrated chef, Andre Garrett, who also lends his name to this finest of England’s dining salons. Andre, a former Roux Scholarship winner was awarded his first Michelin star as Head Chef of Galvin Windows Restaurant and Bar in London. Driving up the (newly laid) drive to Cliveden one cannot fail to be impressed and slightly overwhelmed by the awe-inspiring splendour of one of England’s finest country house hotels. Once in, and ushered past the suits of armour and roaring logs in huge stone fireplaces we were esconced in an exquisite little bay looking out at the newly refurbished dining room. I can’t lie – it did smell faintly of new paint but then this was only day two of the new launch of Andre Garrett‘s new venture. Accepting a glass of Tattinger (it seemed fitting giving the glamour of the venue) Ms S and I studied the frankly beautiful dove grey menu and I unashamedly chose the eight-course tasting menu. Yes I did say eight-courses! Ms S was a little put out as the vegetarian version of the tasting menu is still in development, to be revealed in the new year. I’m delighted as that means we’ll have to go back! Ms S was extremely well accommodated however and had a variety of cheeky extra courses so she could (almost) keep pace with my gourmet feast. Commencing with a fluffy, cod-based amuse bouche (Ms S had the fluff without the cod) we challenged the extremely smiley Sommelier, Guillaume, to recommend us both a single glass of wine each to accompany our meals given that boringly we were both driving. Now what we didn’t expect was a full on experiment to play out in front of us. 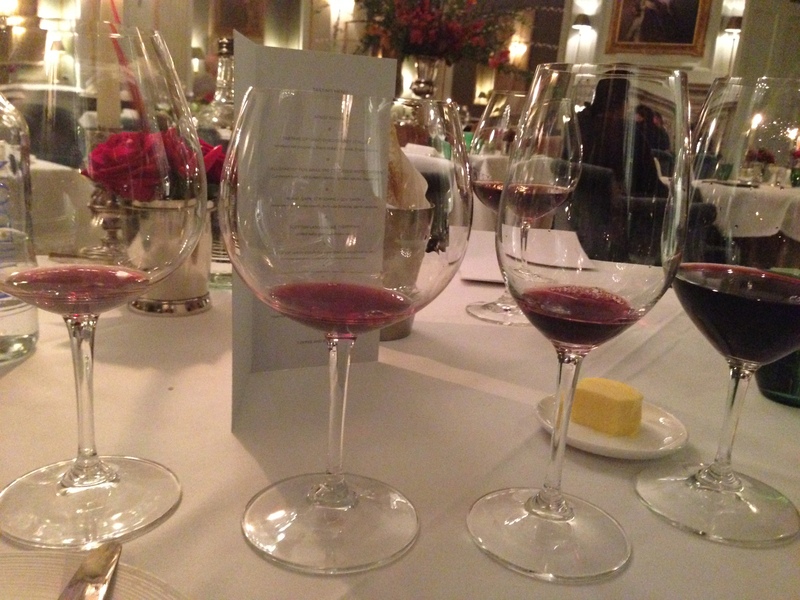 Having delivered a glass of Chateau Caronnes Ste-Gemme Cru Bourgeois, Haut Medoc Bordeaux 2005 to myself and Valtellina Superiore Mazer Inferno, Nino Negri, Lombardia 2008 to Ms S, I remarked how they were served in different shaped glasses. Guillaume flashed his eyes, disappeared and was back in an instant with a further six different shaped glasses whereby he proceeded to demonstrate how each wine tasted varyingly different depending on which glass you were drinking from. Scandal Number One – the two ‘drivers’ now had total of ten glasses on their table! I must mention at this stage the very nice touch that I was given a mini version of my tasting menu to keep, providing me with a ‘map’ throughout my meal. So simple but such a great idea as it’s so very hard to remember these days which three courses I have ordered let alone eight! 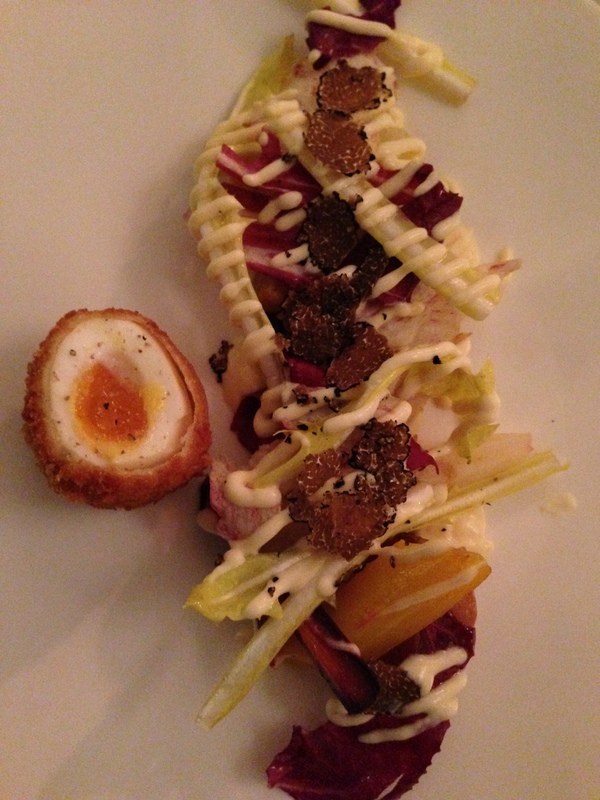 Ms S was served a truly beautiful salad of Winter Roasted Vegetables and Leaves served with Organic Hen’s Egg, English Salad Cream and Truffle Soldiers which she described as divine, especially the truffle soldiers, although slightly large as a starter. I was equally taken with my Tartare of Hand-Dived Orkney Scallops, Smoked Eel Beignets, Black Radish, Cod Roe and English Caviar. It was out of this world – actually probably my favourite dish of all. The Smoked Eel ‘Beignet’ (which is the French term for deep fried choux pastry) was like a crunchy smoked fritter and is quite possibly one of the most delicious things I have ever tasted. We were also served a second amuse bouche, a Pumpkin Espuma, which smelt divine and our charming waitress playfully advised us to dig down to expose the cranberry surprise at the bottom. Well this very nearly turned into Scandal Number Two. Whilst my cranberry jelly revealed itself in all its sweet, melting delight, Ms S dug down to find…nothing? The alarm on the waitresses face turned almost immediately to relief when she realised that chef had not added the cranberry due to the animal extract in the gelatine, thus protecting Ms S from tainting her buddha esque beliefs. Top marks for detail there – and we both ended up with a surprise! 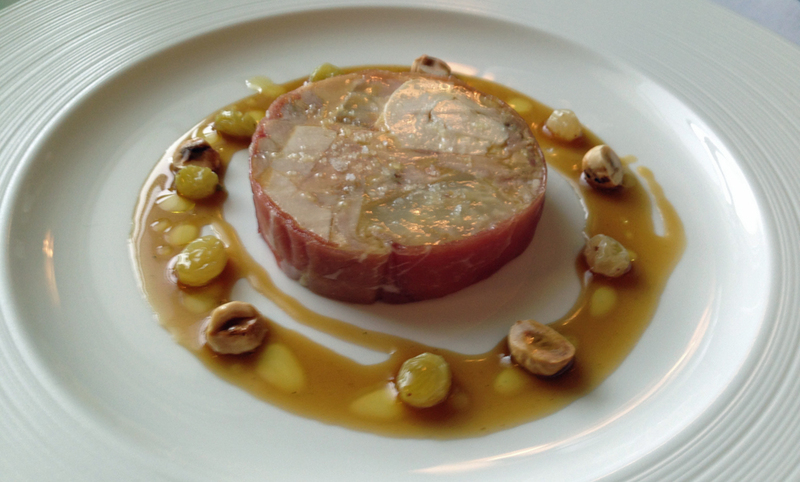 I then moved onto a Ballotine of Fois Gras and Cotswold Chicken with Cumbrian Ham, Salt-Baked Celeriac, Golden Raisins and Hazelnuts. The combinations in this dish were flawless and the hazelnuts added a buttery, nutty crunch that lifted it to something truly special. Ms S was completely spoilt with an unexpected little pot of Potato Gnocci with Winter Truffles and Pumpkin Veloute which she said was her favourite dish of all (note to chef – make sure it’s on the veggy tasting menu!). Now well into my stride I powered through the Roast Game Consomme, correctly guessing two out of the three canapes I was given to dip in the Artichoke Cream which was poured over the top (our waitress tested me) and then I melted into the light and delicious Scottish Langoustine Thermidour with Grilled Baby Gem, Artichoke and Basil (one of Andre’s signature dishes and for good reason). Ms S, slightly obsessed with interior design, kept up a steady commentary on the new room details whilst I was eating, noting the excellent choice of duck egg blue for the walls and almost hessian colour of the carpet. 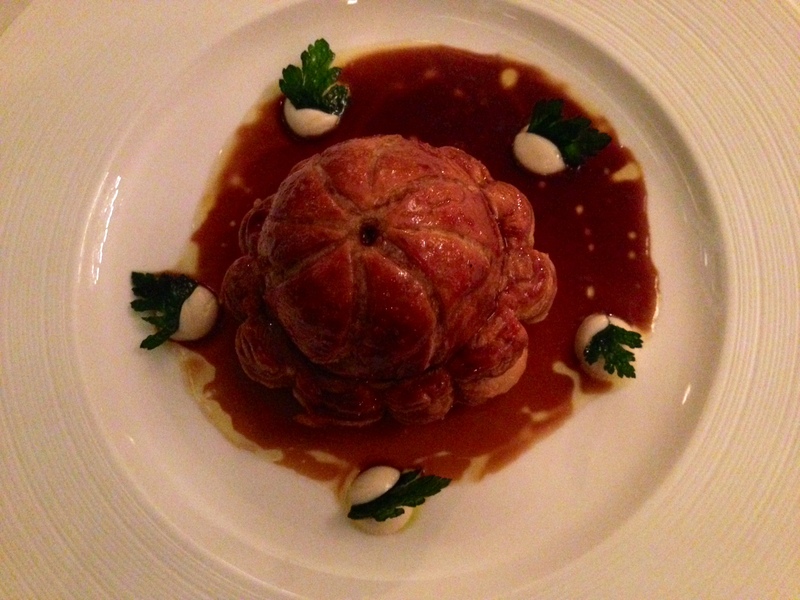 We moved onto our main courses, Ms S was served Wild Mushroom Pithivier with Swiss Chard, Caramelised Cauliflower and Roast Onion Juices. It looked like a cute little hat on the plate but was deceiving in that it was like a Tardis – bigger on the inside than on the out. This year has been a bumper one for mushrooms and Andre Garrett is committed to using English seasonal ingredients which provides a strong story throughout both the Tasting and Market menus. My main was Saddle of West County Venison (Andre hales from Bath) with Braised Shoulder Croquette, Quince, Red Cabbage and poured at the table, a Grand Veneur. Given that I had already consumed five of my eight courses the size of this plate rather overwhelmed – portions are very generous. The braised croquette on its own would have worked for me with that glorious rich Veneur and I struggled to finish the Venison but I admit it is not my favourite meat either. After a respectable rest, the cheese plate was served and I generously shared it with Ms S. Four British Cheeses served with grapes, celery and a raisin fruit bread with stand out Somerset Cheddar and a super creamy Goats Cheese. We were then treated to the most exquisite Fromage Blanc to refresh our pallets. Crunchy meringue, citrusy lemon balm and light granola topping with blueberries and our taste buds were tingled back into life! Our gourmet romp was nearly at an end and the desert stage of our meal was a fitting finale. 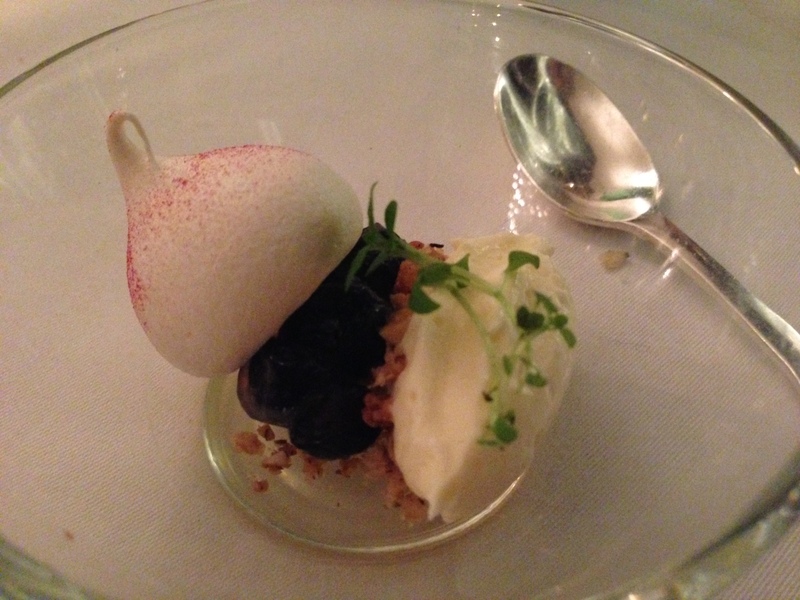 Ms S had the Slow-Cooked Cox’s Apple with Rosemary Caramel, Raisin Puree, Beurre Noisette Crumb and Walnut Ice Cream. For all Ms S’ protestations that she couldn’t manage another morsel she certainly made an extremely brave attempt on this pudding. The Rosemary Caramel was divine though we agreed that the Walnut Ice Cream was a little too earthy. I had the 72% Chocolate Ganache Florentine with Salted Caramel and Popcorn Ice Cream. This desert has possibly all my favourite sweet things included within it so it would have been practically impossible to be disappointed. The florentine was utterly divine and the caramel popcorn stick that accompanied was three bites of pure heaven. Now trundling around the room from time to time I kept noticing a sparkling flash of glass and colour that had caught my attention. It was the Bon Bon Trolley. As Ms S had set her sights on collapsing into a large armchair in front of a crackling fire to have her green tea I started to panic that the trolley would not find us… happily I was wrong. Scandal Number Three could well be that while Ms S was distracted talking to Guillaume I selected us one of everything from this collection of delights. It made me think of the film Chitty Chitty Bang Bang as ‘Truly Scrumptious’ kept being played in my head. Nougat, macaroons, mango marshmallow and tiny Paris-Brest alongside honeycomb, truffles, sprinkled chocolate and my head was spinning. 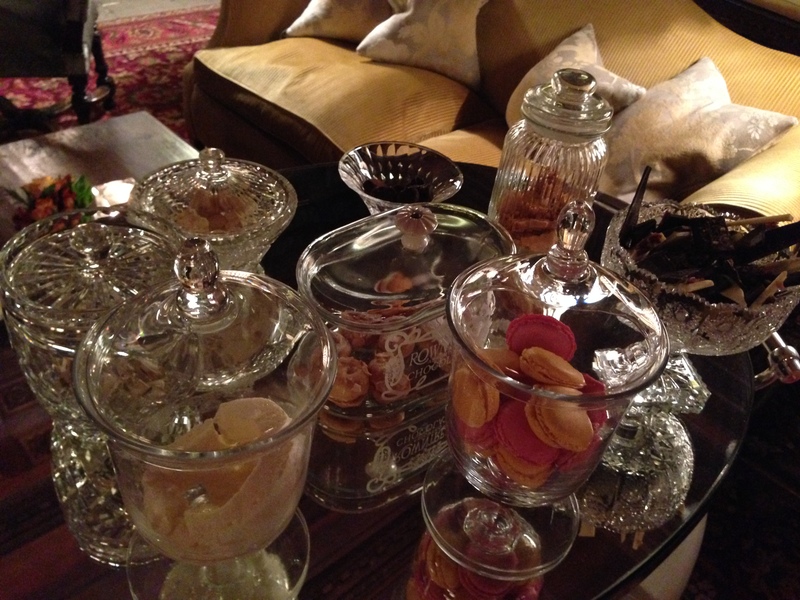 For a point of difference, this lovely idea really adds a charming touch to the dining occasion and could become a new legend ‘The Cliveden Bon Bon Trolley’ – in fact I’m going to start its own hashtag! As we wrapped up and headed back out into the frosty night (after briefly contemplating swapping one of the Cliveden branded XC90’s with my dusty Volvo – Scandal Number Four?) we were already planning our return. What Cliveden has achieved with its master stroke of locating Andre Garrett in its restaurant, is an authentic fine dining salon, showcasing clever, elegant food which retains the classic integrity of its setting. He is also a thoroughly lovely chap which is again in keeping with Cliveden’s excellent, experienced and passionate new team. There is no way this can not succeed. 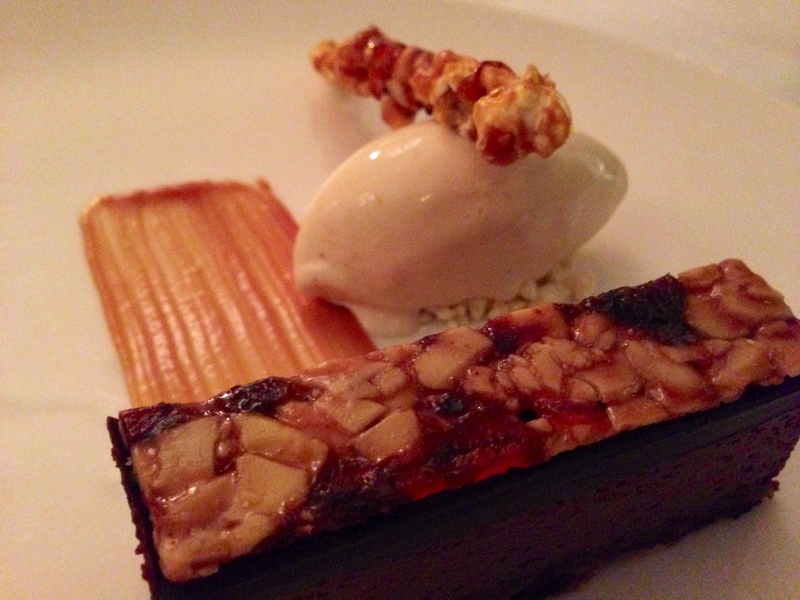 Eight Course Tasting Menu £95 per person and additional £75 with Wine Pairing. Market Menu is £65 three courses for Dinner and £28 three courses for lunch. Design Restaurants were guests of Cliveden House Hotel. Design Restaurant members dine complimentary at Andre Garrett at Cliveden House (when joined by at least one full paying guest – therefore menu prices above will be the price for two) dinner Sunday to Thursday and Lunch Monday to Friday. Not a member? At £90 for 12 months membership, the cost of your card is redeemed in one sitting at Andre Garrett. Join online now at www.designrestaurants.com.